In this house no-one likes brown bananas, not even with a hint of a speckle. They have to have just turned yellow, with still a hint of green at the top. To be fair, the three year old doesn't like any sort of banana, or in fact any kind of fruit ( apart from in the form of apple juice ) or anything that looks remotely like a vegetable. As a result of such selective banana eating, the fruit bowl quite often contains bananas that have turned a lovely mottled yellow. Preheat the oven to 180 degrees C, 160 if using a fan assisted oven. Line a muffin tray eight muffin cases. Mix together wholemeal and plain flour, oats, sugar, bicarb, baking powder and raisins/walnuts if using. There is no need to sift any of these ingredients. Sifting will not incorporate air, but was used in the 'olden days' to get rid of any unwanted critters that might have taken residence in the ingredients. In a separate bowl, mash the bananas and mix together well with the yoghurt, egg, lemon and lemon zest and the vanilla essence. Add the wet ingredients to the dry and mix together until the flour is just incorporated and a few flecks of flour are still visible. Overmixing will lead to a muffin with a very solid texture. The mixture should be of a heavy dropping consistency. If not add a splash of milk. As the wet ingredients will be reacting with the raising agents at this stage, immediately fill each muffin case about 3/4 full with the mixture. If you prefer more of a pronounced 'muffin top', fill almost to the top - in this case you will only need six muffin liners. An ice cream scoop can help you to do this with less mess and ensures an even distribution. Bake in middle of oven for 20 minutes. Check that muffins have an even golden brown top, and that they are done by inserting a skewer into the middle of a muffin. The skewer should come out dry, apart from perhaps a little bit of banana adhering to it. If not, bake for another 2-5 minutes. 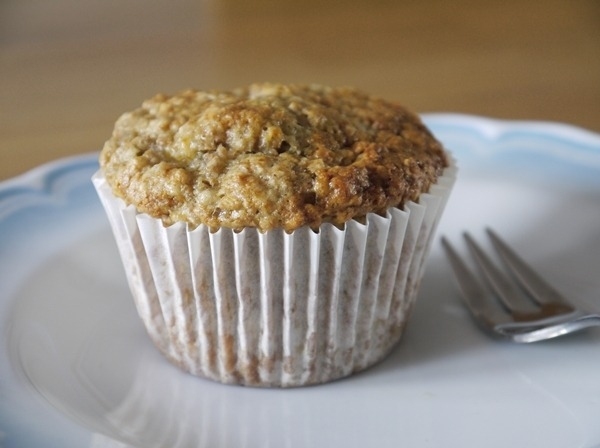 These muffins keep well in an airtight container, and also make for a great breakfast which will keep off hunger pangs until lunch.